Frantz Fanon was a French psychiatrist turned Algerian revolutionary of Martinican origin, and one of the most important and controversial thinkers of the postwar period. A veritable “intellect on fire,” Fanon was a radical thinker with original theories on race, revolution, violence, identity and agency. This book is an excellent introduction to the ideas and legacy of Fanon. Gibson explores him as a truly complex character in the context of his time and beyond. He argues that for Fanon, theory has a practical task to help change the world. Thus Fanon’s “untidy dialectic,” Gibson contends, is a philosophy of liberation that includes cultural and historical issues and visions of a future society. In a profoundly political sense, Gibson asks us to reevaluate Fanon’s contribution as a critic of modernity and reassess in a new light notions of consciousness, humanism, and social change. This is a fascinating study that will interest undergraduates and above in postcolonial studies, literary theory, cultural studies, sociology, politics, and social and political theory, as well as general readers. Nigel C. Gibson is Director of the Honors Program at Emerson College, Boston, and a research associate in the Department of Africana Studies at Brown University and the Department of Afro-American Studies at Harvard University. 1. The Racial Gaze: Black Slave, White Master. 2. Psychoanalysis and the Black’s Inferiority Complex. 3. Negritude and the Descent into a “Real Hell”. 6. Radical Mutations: Toward a Fighting Culture. 7. Crossing the Dividing Line: Spontaneity and Organization. 8. Nationalism and a New Humanism. An outstanding introduction to the work of Franz Fanon, one of the most important and controversial thinkers of postwar period. Fanon was an anti-colonial / postcolonial critic whose work spans across the political and academic disciplines of philosophy, psychiatry, social science, and literature. Gibson clearly sets out the intellectual and social contexts of Fanon's thought. 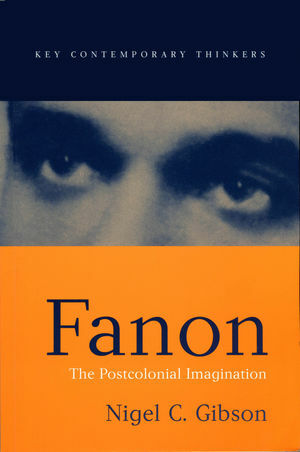 This book offers an original and challenging re-assessment of Fanon's contribution and its legacy.